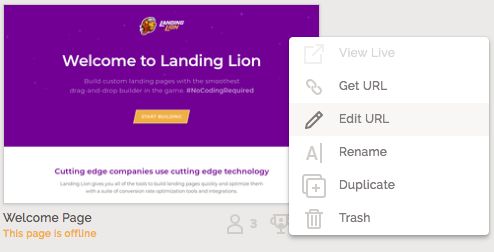 ❗️This article assumes that you have successfully set up and verified your third-party custom domains with Landing Lion. Now that you have added your domain to your Workspace and added the CNAME record in your DNS settings, you must set the domain for your page. 1. Hover over the page you want to apply the domain to, and click on the ellipsis on the top right to access the page actions. 2. In the page actions dropdown, click "Edit Page URL"
3. In the modal that pops up, click the drop-down on the left to show all verified domains for your current Workspace. ⚠️ If your domain is not in the list, go to the Domains tab in Settings and make sure your domain has been verified. Also double-check your DNS settings. 6. Click "SAVE" to set your page's domain and URL. That's it! You'll need to repeat the process for every existing page you have to use your custom domain(s).